This section describes how to install JDK Documentation on your own machine. To learn JDK more effectively, you definitely need to have a copy of the JDK Documentation installed on your own machine. JDK Documentation provides you detailed information of all classes and methods used in JDK. Here is what I did to download and install JDK 10 Documentation on my local machine. Open the Java download home page with this URL: http://www.oracle.com/technetwork/java/javase/downloads/. Click the "DOWNLOAD" button next to "Java SE 10 Documentation". 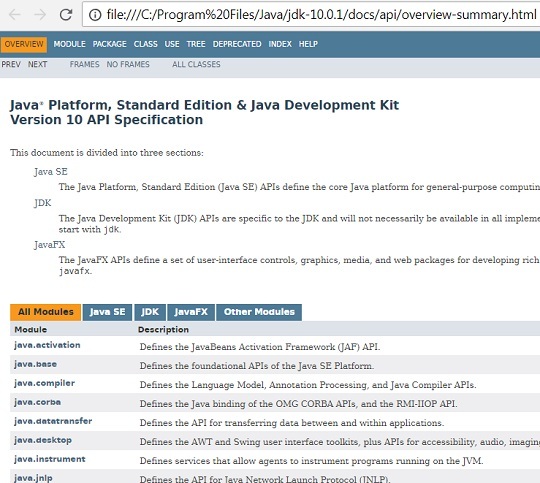 You will see "Java SE Development Kit 10 Documentation" page showing up. Check the "Accept License Agreement" radio button. Click the hyper link of "jdk-10.0.1_doc-all.zip". Save the download file "jdk-10.0.1_doc-all.zip" to a temporary directory. Double-click on "jdk-8-apidocs.zip" to extract all files to "C:\Program Files\Java\jdk-10.0.1 directory. The installation of JDK 10 Documentation is done. Click the "java.logging" module on the JDK 10 Documentation page to see the API documentation of the java.logging module.